Holder’s Pest Solutions has been providing top of the line termite control services to Houston area residents for nearly 70 years. Our specialists have helped identify and mitigate termite infestations in countless homes. As much as we enjoy helping our customers with their termite problems, we also love sharing our expertise. So, we’ve put together our answers to some of the most common termite questions for your reading pleasure. While termites may cause awful damage to your property and home, they do not pose a direct threat to humans. Termites have been known to bite and sting, but their bites are not poisonous or toxic. Additionally, termites are not known to carry diseases harmful to humans. Although they might not be directly threatening, some people have been known to suffer allergic or asthmatic reactions to active termite infestations. It’s well known that termites love to eat wood, but they’re actually more interested in cellulose. Cellulose refers to the common organic compound that is a main component in a plant’s cell walls. This material can be found in many common items we use in everyday life including clothes, paper, cardboard and more. 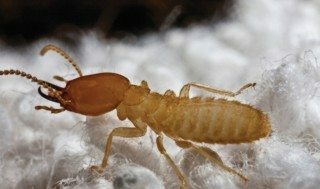 While termites will eat a wide range of things containing cellulose, they need the assistance of symbiotic microorganisms that live in their digestive tract to breakdown the cellulose and absorb its nutrients. The obvious answer is that only the termites with wings are able to fly. Only one caste of termites, alates, are equipped with wings and able to fly. Alates are also the only termites which are developed to reproduce and are destined to become colony Kings and Queens. Termite swarms are meant to develop new colonies. Alates, those termites equipped with wings that we just mentioned, will fly from the colony in search of a suitable partner to begin a new colony with. Termites tend to swarm at the beginning of the spring during warm weather and after a healthy rain. Termites are active year round, as they find shelter from the cold by going deeper underground or finding warmth in heated buildings. Spring and summer, however, are the most active seasons for these pests. In regions like Houston with warmer temperatures year round, termites are more consistently active compared to areas with colder winters. Regardless of the season, termites are on the move. If you’ve got more termite questions that haven’t been answered, drop us a line, we’re always happy to help. If you think you may have a termite problem, contact our certified professionals so we can send help your way as soon as possible.